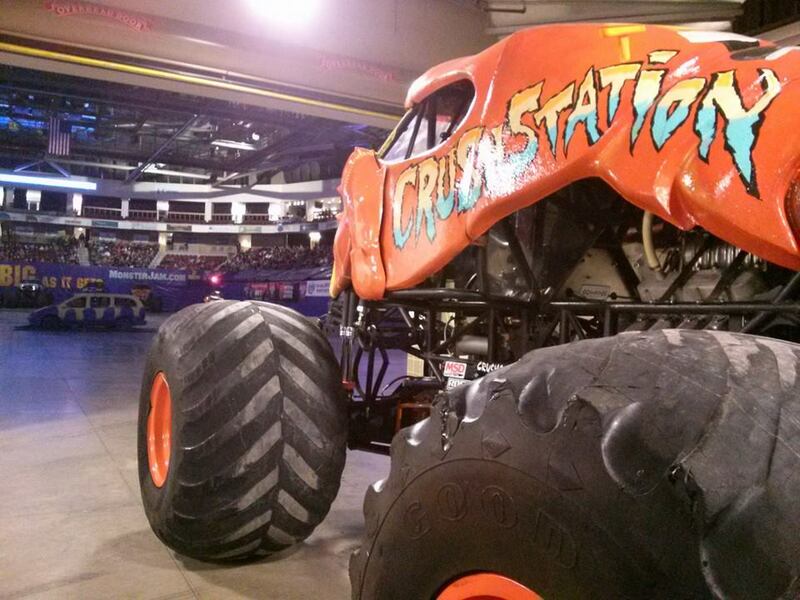 The Crushstation team was on a tear for the 2014 Monster Jam season, turning heads with the wicked 3D Lobster body and earning the most wheelie contest wins than any other Monster Jam Truck in competition! “To have the most wins out of the top 150 trucks in the world says something about my team. The fans see Crushstation going vertical and planting the lobster tail, but a lot don’t see the time, dedication, and support from our sponsors behind the scenes to allow us to get these wins. I have the best team and the best sponsors in this industry; hands down”, said Team Owner and Driver Greg Winchenbach. In 10 shows in 3 months across the United States, Greg and Crushstation won 23/27 wheelie contests, which is an incredible 85% win margin. 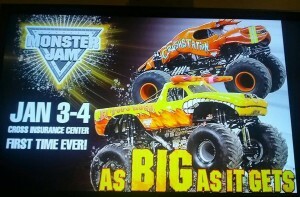 The action doesn’t stop after Monster Jam as the crew has their busiest summer schedule yet. With only a few short months in the shop, Crushstation is being taken apart and reconstructed to ensure top performance. On top of everything, the team has a few tricks up their sleeve for the upcoming year, including the unveiling of a huge surprise this summer. 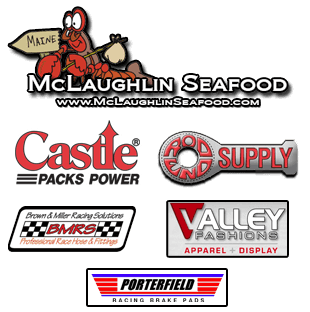 “We don’t want to let the surprise slip just yet, but Bottom Feeder Motor Sports is growing and we can’t wait to add exposure for our sponsors on the latest creation from our Race team.” With so much happening in the growth of Bottom Feeder Motor Sports the team will finish the month of April and all of May at Monstah Lobstah HQ. 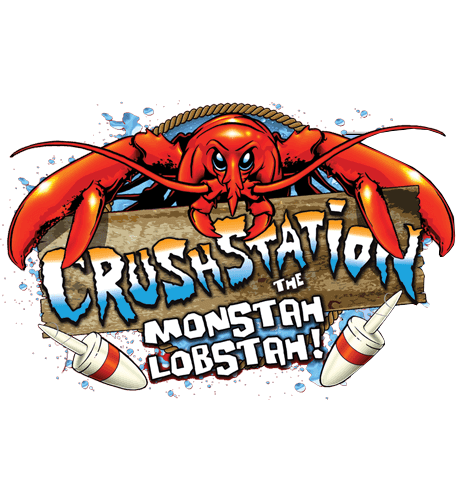 Stay tuned to our Facebook page for Shop Updates (www.facebook.com/Crushstation) and our website for our Event Schedule (www.TheMonstahLobstah.com/Event-Schedule/). The 2014 season is officially underway and “The Monstah Lobstah” is already putting the claws to the competition. 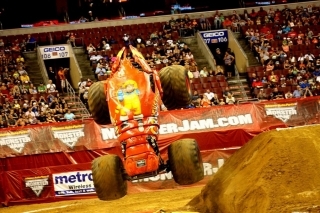 The first event of the new year would take place just down the road from home as Monster Jam invaded the Cross Insurance Center for the very first time. Three big shows with some tough competition, but those of you who know Greg Winchenbach and Crushstation know that there is no backing down, especially when performing in front of our great Maine fans. The year got off to an incredible start Friday night as Greg would power Crushstation to the wins in the first two competitions, taking wheelies and working through the brackets to win racing. The night would still end will, with runner-ups in both donuts and freestyle. Saturday kicked off with a great Pit Party and afternoon event, with Greg once again putting Crushstation in victory lane in wheelies and racing. After once again coming in 2nd in donuts and freestyle, Greg and crew chief Michael Thompson went to work preparing the truck to let it all hang out for the final show of the weekend. The team was determined to try and sweep wheelies and racing for the whole weekend, and with some incredible efforts, that’s exactly what Greg was able to do. After once again falling just short in donuts with another 2nd place and only one competition left, the focus was placed solely on grabbing the final freestyle of the weekend. Following an action-packed run featuring wheelies, donuts and lots of momentum, there would be no denying victory for The Monstah Lobstah as Greg took the win. The team would like to say a special thanks to all of our great fans and sponsors who make it all possible. 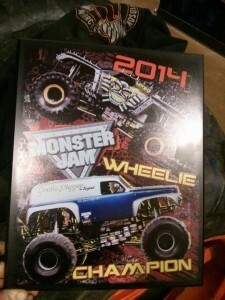 We couldn’t have imagined a much better start to 2014 than taking 7 wins and 5 runner-ups in 12 competitions against some of the top Monster Jam trucks in the business. Next up, we’re off to a huge event at Detroit’s Ford Field – wish us luck! As Bottom Feeder Motor Sports looks back on a fantastic 2013 season and prepares for an even bigger 2014, we wanted to give you a quick update a trip we took a couple weeks back. For the first time in a few years, we headed to the Performance Racing Industry Trade Show in Indianapolis, Indiana a couple weeks back. There we were able to meet with some of our great sponsors including Rod End Supply, Brown-Miller Racing Solutions and Valley Fashions. Valley Fashions always keeps us looking good with their incredible line of crew shirts and their awesome sublimated hoodies. We strongly recommend anyone in need of professional clothing to give them a look at www.ValleyFashions.com. Big thanks to Dan and the whole crew for showing us off at their display booth as well! In addition while in attendance, we ran into our friends at TheMonsterBlog.com who were filming a special segment for their TMB TV video series. They met us at the booth of Rod End Supply, our incredible rod end sponsor. Greg did a quick interview talking about some of the reasons why everyone in monster trucks should consider using Rod End Supply on their trucks. PRI 2013 was a great experience and now we’re back at the shop making final preparations on Crushstation as we look forward to the first event of 2014 just down the road from home, Monster Jam at the Cross Insurance Center in Bangor, Maine! Our final Monster Jam event of 2013 is now in the books and what an incredible show it was! It was a great privilege for Greg and Crushstation to be invited to the first monster truck event at the Wells Fargo Center in Philadelphia, Pennsylvania, especially when considering the lineup of trucks competing. All three of the Andersons, Steve Sims, Damon Bradshaw, this was a big time lineup to battle it out over 4 shows. With such tough competition, the weekend really couldn’t have gone better for the “Monstah Lobstah”, as Greg managed to sweep all 4 wheelie contests with his patented “Lobstah Tail” wheelies. Racing wouldn’t produce too many highlights for the team, but Crushstation finished near the top in most of the freestyles as well, including a tie for second on Friday night. With the final Monster Jam of 2013 now done, the Bottom Feeder Motorsports team will go to work getting the truck ready for January when we kick off a whole new season. A big thanks to all of our great sponsors who make it all possible, and to all our amazing fans whose support allows us to do what we love. Viper Venom Fuels is proud to announce we are now supplying Greg Winchenbach, the owner and driver of the Crushstation “Monstah Lobstah” professional monster truck with our Viper Methanol. 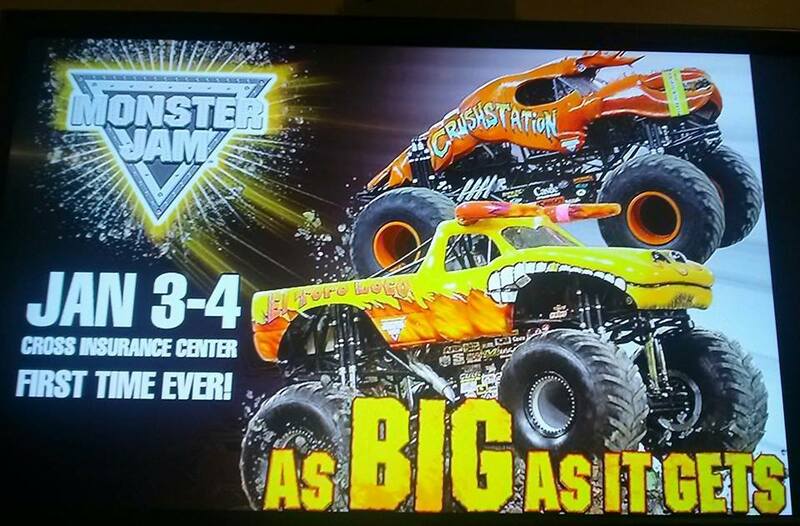 Our first Monster Jam with Crushstation is this weekend, October 4th-6th at the Wells Fargo Center in Philadelphia, Pennsylvania. 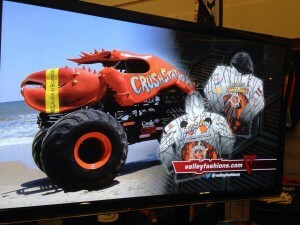 Look for Crushstation with the Viper Venom logo this weekend at the show! 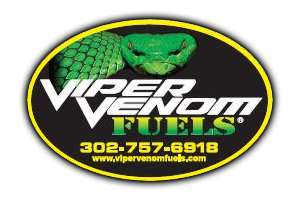 For more information on Crushstation, visit www.TheMonstahLobstah.com and for more information on Viper Venom Fuels, check us out at www.ViperVenomFuels.com!